It is a deciduous cultivar is noted for its fresh spring foliage which emerges orange-pink. This then matures to deeper shades of green, splashed with cream, tan and pink. The leaf undersides are a rich purple. The flowers are insignificant, and the subsequent winged seeds are borne in pairs and twirl to the ground when ripe. Be aware that any viable seedlings produced are likely to emerge as the original Acer pseudoplatanus species. 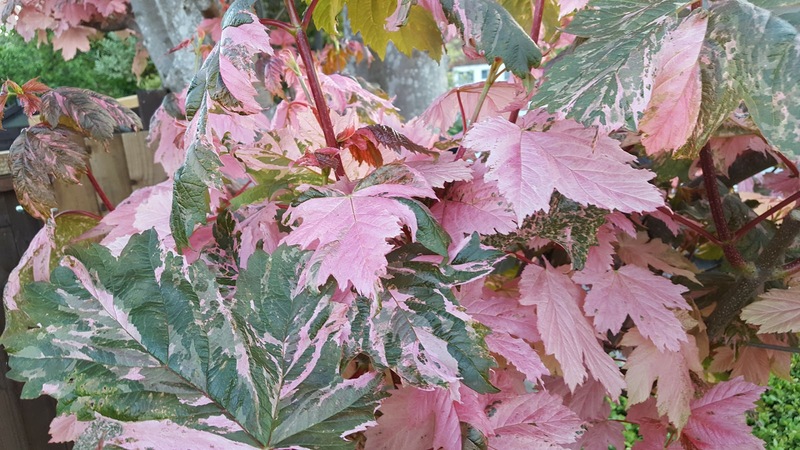 Under favourable conditions you can expect Acer pseudoplatanus 'Esk Sunset' to reach an approximate height of 4 metres tall, with a width of 3 metres after ten years or so. Once fully mature, a height of 25 ft. tall may be achieved. It will perform best in a sheltered position away from drying winds, in a full sun to partial shade, but in regions which experience particularly hot summers, it would be best to provide afternoon shade to avoid leaf scorch. While the foliage tends not to burn in full sun it will affect the foliage colour. Plant in a moist, humus-rich soil, but avoid soils prone to waterlogging. During its first year water regularly, especially during extended periods of drought.